The KBCC™ Series by KB Electronics features chassis mount variable speed DC drives, which are able to control Shunt Wound and PM Motors through 3 horsepower. The series features two models rated from 1/100 thru 3 horsepower. 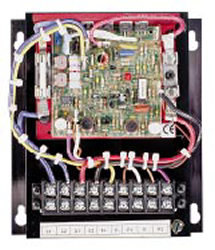 These use KBMM™ modular control and are equipped with KB’s exclusive Plug-in Horsepower Resistor®. This eliminates the need for recalibration of the IR Comp and Current Limit when the the drive is being used on various horsepower motors. KBCC™ models that have the “R” suffix feature the KB APRM®*, which provides anti-plug “instant” reverse and solid state dynamic braking. Also, a feature called Inhibit™ allows for electronic switching of the armature voltage. Auto Inhibit® provides rapid safe switching of the AC line. KBCC™ drives are designed with a rugged aluminum 7″ heatsink and contain AC line and armature fusing. Other features include 5K ohm remote potentiometer, a barrier terminal block, adjustment trimpots (MIN, MAX, IR COMP, CL, ACCEL and DECEL), and more.